From 30 November to 11 December 2015, France will host the 21st Conference of the Parties to the United Nations Framework Convention on Climate Change (COP21/CMP11), also referred to as "Paris 2015". The aim of the conference is to reach a new international climate agreement, applicable to all countries, to maintain global warming below 2°C. Designed as stepping-stone to Paris 2015, MED COP21 was hosted by the PACA Region in the Villa Méditerranée on 4 and 5 June. The event, held under the high patronage of the President of the Republic François Holl ande, brought together several hundred leading figures from all countries in the Mediterranean region. Moving towards sustainable development is in itself a driver of economic, social and technological development. 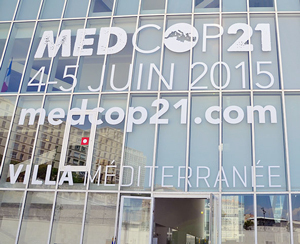 MED COP21 plays a role in this by putting forward tangible proposals for projects in the Mediterranean. Among the various stakeholders present, Plan Bleu contributed to several workshops and, on 3 June, presented the results of the methodological report on "the regional and local assessment of the risks of climate change and variability in the Mediterranean" which it prepared alongside Acclimatise and its partners in the context of the ClimVar and ICZM (Integrated coastal zone management) project. The results of this study should contribute to the preparation of the strategic framework for the adaptation of Mediterranean coastal and marine areas to climate change, under the auspices of the United Nations Environment Programme.